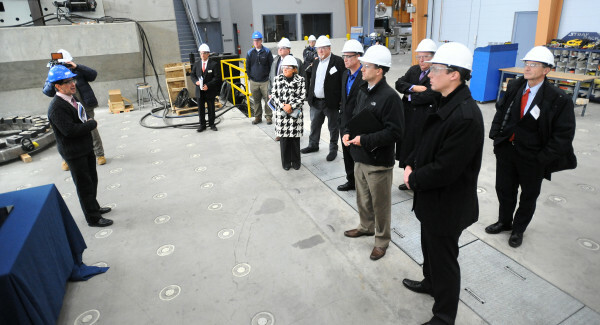 People tour the Advanced Structures and Composites Center during a press event at the University of Maine in Orono. Tom Swanson, manager of Pew Charitable Trusts' clean energy initiative, attends a press event at the University of Maine in Orono. 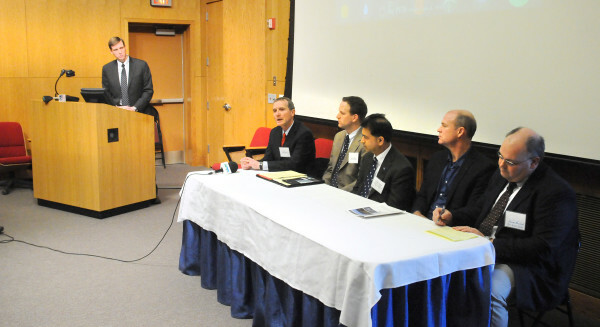 A panel discussion during a press event at the University of Maine in Orono. ORONO, Maine — Maine set an example for other states to follow in its renewable energy investments and growth during the past decade, according to a report released Monday by the Pew Charitable Trusts. “By establishing aggressive goals for clean and efficient energy, Maine is harnessing its renewable resources to create new job opportunities, attract investment and strengthen its manufacturing base,” Tom Swanson, manager of Pew’s clean energy initiative, said. Pew, a nonprofit that aims to shape public policy through research in the areas of the environment, economic policy and health, hosted an event and panel discussion at the University of Maine in Orono on Monday morning and unveiled its findings. Maine was one of eight states Pew chose to highlight in its “Clean Economy Rising” initiative, the others being Georgia, Michigan, North Carolina, North Dakota, Ohio, Pennsylvania and Texas. States were recognized for different contributions. The report on Georgia, for example, trumpets that state as the fastest-growing solar energy market in the country. Pew’s report lauded Maine for having the highest renewable portfolio standard in the country, calling for 40 percent of the state’s total electric supply to come from renewable energy sources by 2017. Most other states call for about 10 percent. 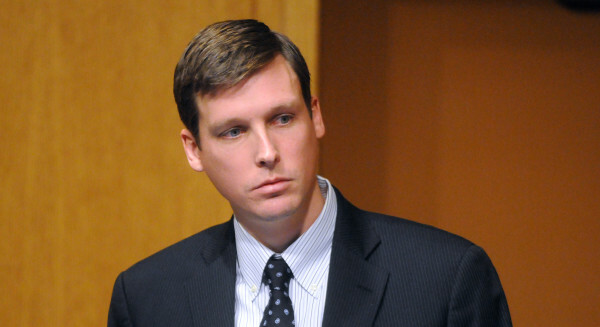 The report drew cautious praise from one state official. LePage and his administration have stressed that it is important for the state to focus on its immediate energy costs, which has been a hindrance for taxpayers and businesses. Certain renewable energy sectors, such as offshore wind and tidal power, are in their infancy and aren’t yet cost competitive, Woodcock said. Still, in other sectors, prices have come down as technologies develop and infrastructure grows, “which is obviously a very positive development,” Woodcock said. As of 2013, Maine had 13 wind developments contributing 431 megawatts of wind capacity, with another 1.3 gigawatts of capacity in various stages of planning, according to the report, though several of those future projects have met strong local resistance. Large developments in 2011 and 2012 in Woodstock and Lincoln, respectively, made Maine the largest generator of wind power in New England. Pew also took great interest in UMaine’s efforts to expand the state’s wind energy to the Gulf of Maine. In 2013, Maine’s 1:8-scale VolturnUS prototype became the first offshore floating wind turbine to be connected to an electric grid in the United States. That prototype spent about a year floating off the coast of Castine. Swanson toured the Advanced Structures and Composites Center, where the university tests wind turbine blades and composite materials for strength and performance. He also visited the Forest Bioproducts Research Institute on campus. Swanson said Pew saw frequent references to the University of Maine when researching energy initiatives and developments in other states. The university helped companies across the nation with product testing and development in many forms, he said. “We were really impressed with the breadth of what the university is undertaking,” Swanson said. Biomass energy will continue to be vital to Maine’s renewable energy efforts, Pew stated. The most heavily forested state in the nation, Maine generates about 2.1 million kilowatt hours of electrical power from biomass. That’s a quarter of all electricity generation in the state and the most per capita of any state, according to Pew. Maine also was home to the nation’s first commercial, grid-connected tidal energy project, located in Cobscook Bay, a project that “grew from innovative research and development by corporate, academic, and government partners,” the Pew report states. Pew predicts sustainable energy industries will continue to grow in Maine, estimating $1.9 billion in private investments by 2023. For that to happen, companies investing in clean technologies and infrastructure need stability, Swanson said. Drastic changes in Maine’s sustainable energy policies or reductions to development incentive programs could stifle investment. Companies that invest in energy need “long-term certainty,” Swanson said. Maine renewable energy officials praised the Pew study as evidence that investments are working and should continue to grow.